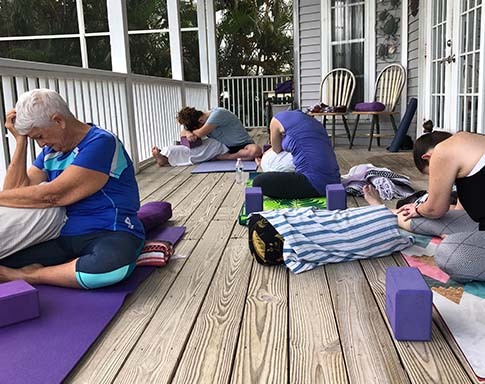 I offer clear, concise compassionate yoga teaching in Southwest Florida that will help you reach your fitness goals, recover from injuries or just feel better. Connect with my yoga teaching. As an older yogi who cut my teeth as a classroom science teacher, I stress safety. My experience as an adjunct University Professor and full-time science teacher has given me the tools to reach students of all levels. I specialize in building classes and workshops that meet my students where they are. I offer compassionate assistance when needed. I also am very clear and precise in my instructions. I approach yoga teaching as an expert classroom teacher would. In other words, I come prepared with a lesson plan that is based on current research in the Best Practices of Yoga as a healing practice. Yoga for Wellness is appropriate for all levels of students. 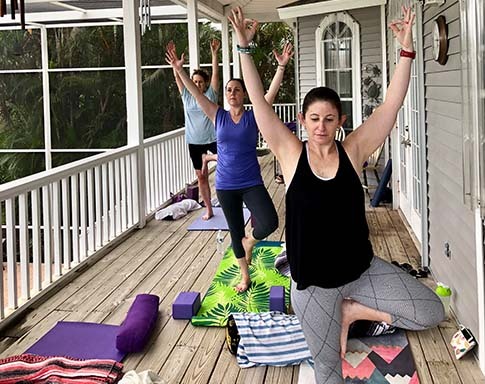 Each week, we will explore different health themes and healing yoga routines in a small, comfortable, beautiful setting. You will leave these classes not only feeling better but with a wealth of information to help you stay healthy off the mat. I believe “yoga should be healing”. You will explore the yoga poses and the sensations within your own bodies, mind, and spirit. This customized approach allows you to gain more control of your health. Each class will conclude with a reading or a poem that help you find meaning in your practice. Yin/Yang Yoga Yin Style of yoga comes from the Daoist Tradition out of China. It is often associated with Traditional Chinese Medicine. I have received advanced training in Yin. Many of my students find this style to be extremely grounding. It is perfect for athletes who need deep stretches and a calmer practice on their recovery days from their sport. It is also used widely with people who are recuperating from illness or who have conditions such as Rheumatoid Arthritis. It also appeals to people who want a quieter, slower way of practicing yoga. Add the beauty of nature and my personal attention to every detail including arranging your blankets and assisting with blocks to allow you to reach your edge in your stretches and you will leave this class as if you have just had a massage. Whichever class you attend on Heaven Lane, please arrive 15 minutes before class if possible. Please park either in my over-sized driveway or the cul-de-sac on the side of my house. Enter through the screened in lanai to access the upstairs large wooden deck overlooking the pool and natural area. If you have yoga props, please bring them including blocks, straps, towels, blankets, bolsters. Water will be available and essential oils will be shared. Make sure to drink lots of water for at least 24 hours after each class. And don’t hesitate to reach out to me if you have any questions or concerns. Price $12.00/student. However, if you buy a 10-class card good for one year, classes are just $10/class. I accept cash and checks at my location. You can pay with Paypal too. There is a small credit card processing fee. You can use the Paypal Button you see that says Buy Here. Andrea is truly a teacher, first and foremost. Attending her class is like getting a private session in your living room. I leave Andrea’s classes so relaxed. They are like a lullaby. 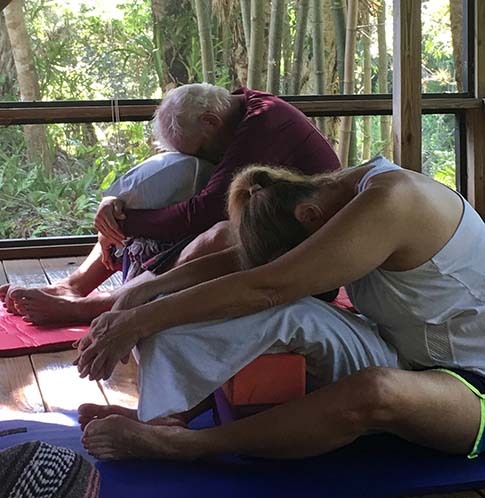 I just returned from the Kripalu Institute and spent two weeks with the top yoga teachers in the world and I can tell you Andrea is right with them in everything she says and does in her classes. 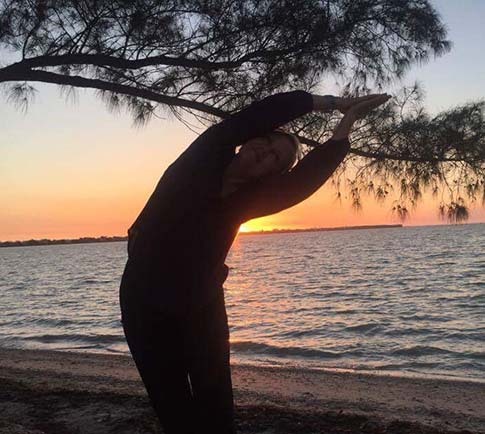 Private Instruction: Experienced Yoga Teacher Andrea Trank is also available to do private or semi-private yoga instruction. Skills from 25 years of teaching classroom science translate well to working with students of all ages on the yoga mat. I give you clear, yet compassionate instructions. I have a keen eye for safety and know how to make you feel comfortable trying new skills. I specialize in working with beginners and people who are recovering from injuries or illnesses. My passion for yoga and my own journey from illness to health are testaments to the benefits of this practice as well as the nutritional changes I have made. Schedule a 30-minute free consult to see if I can help you on your journey toward health. Privates must be paid in advance if I am coming to your home. Discounts are offered for packages paid for in advance. 10 classes prepaid ($900.00) $100.00 savings. Prices are based on 75-minute classes. I am available to come to your location (distances of more than 10 miles round trip will have mileage added—an extra $10.00) or we can arrange a mutual time with me to do privates at my home. I am fully insured, licensed, have my own equipment and am CPR certified. Health Coaching and essential oils coaching may be added if interested. Use the following contact form please to arrange your FREE 30-minute consultation. Let’s get started on your journey toward better health and happiness. My husband and I both have autoimmune disorders. I have fibromyalgia and needed a Yin Yoga class for myofascial release. I started Andrea’s Friday class, and it did wonders. So, I thought I would approach my very Pittsburgh, masculine, 6’5″, prior college quarterback with significant Rheumatoid Arthritis (feet, hands and spine) to attend her class with me. When all else failed I bribed him with Pittsburgh Steelers football tickets, and he went! Since that first day he sings Andrea’s praises (which he never does of anyone else, seriously). If he misses he feels worse and complains of pain. Thank you Andrea from the bottom of his RA feet to the top of our heads, and everything in between. Life is good! Trust me, you will love Andrea, AND feel so much better. In the Fall of 2016 I found Andrea teaching yoga at a nearby lovely outdoor center. I went to her class and it was like coming home. The overall experience felt like listening to a lullaby. Her gentle teaching style and encouragement to do what is best for you, along with hands on guidance is a perfect fit for me. Andrea has a keen knowledge of the anatomy being a retried science professor along with her ongoing quest for continuing education. She assists her students with proper alignment with adjustments perfectly tailored for each individual. Her class has a one-on-one feel. Andrea is creative, a wonderful teacher and a very kind soul. Ask about our FREE 30-minute consultation and discover how Heaven Lane can get your life on the path to health and happiness.